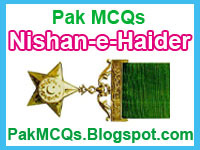 Hi, How are you In this post I am going to tell you who received Nishan-e-Haider in Pak-Army. Only ten Nishan-e-Haider medals have been awarded since Pakistan's independence on 14 August 1947. Nine were to members of the Pakistan Army, and one to a member of the Pakistan Air Force. Below is the list of Nishan-e-Haider recipients. Tags: Nishan-E-Haider , Nishan-E-Haider List , Nishan-e-Haider Pakistan Army , Nishan-e-Haider Who Get.